UPDATE: Congrats to Niamh, who won the Daniel Tiger back-to-school pack! Please email me at losangelesstory@gmail.com with your shipping info. Thanks to everyone who participated! A little tiger is looking to make a big splash on Monday, Sept. 3, when Daniel Tiger's Neighborhood premieres on PBS Kids. I was able to attend the TCA Press Tour this summer and talked to the show's executive producers Angela Santomero and Kevin Morrison. (Read it here.) I loved hearing about the research they did with children, the development work of creating fun songs that give kids actual solutions, as well as the surprises that came with creating a new animated program inspired by Fred Rogers. Be sure to check it out on Labor Day! For added fun, I'm giving away 1 Daniel Tiger package, courtesy of PBS Kids, that includes a Daniel Tiger luggage tag, backpack, crayons, printables, pencils and stickers. To enter, please leave a comment below telling me what you like about the show. Good luck, and I will announce the winner on Friday, Sept. 7. Read all about it on mom.me. 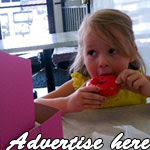 Read about our marital back-and-forth on mom.me. 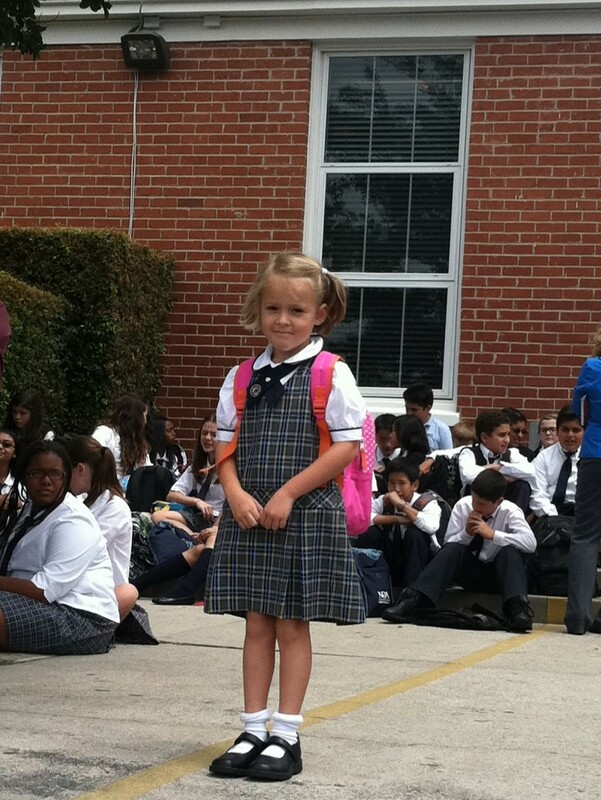 Happy First Day of Kindergarten! Yes, there were tears this morning, and they should have been expected. 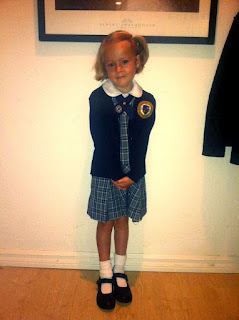 But honestly, I had no idea I would become a practically blubbering mess when I dropped CC off at school (real school!) this morning. Today was CC's first day of kindergarten, and that seems so impossible. We've been thinking about this day for so long, and finally here she is. And she was ready. She could barely sleep last night, she was so excited. And this morning, putting on her little uniform for the first time, she said, "Mommy, I'm going to think it's great!" She already knew, and I crossed my fingers and held my breath every minute hoping she was right. In my own first-day nervousness, I got to her new school extra early this morning, fearing I would make some sort of drop-off mistake. The process is a precise and efficient one -- one that involves me staying in the car while a parent volunteer takes CC from her car seat and walks her to her kindergarten group. When I saw that we would be early, I said, "Bear (which is what I call her most of the time), why don't we drive around the block, so we're not so early." I guess it was hard for me to let go. "No, Mommy," she said. "I don't want to drive around the block. I want to go." "You don't mind sitting outside for a few minutes before the bell rings?" I drove into the driveway, where a line of parent volunteers awaited the next car. I had discussed with her the whole process the night before, explaining that I wouldn't be able to get out of the car and go with her. So we decided that I would give her two special squeezes on her cheek, so she would know that I loved her and that I was proud of her. Then I stopped, and a woman opened CC's door, unlatched her car-seat belts and held her hand. "C'mon, honey," she said. "You must be new." I reached my hand into the back seat to give her the squeezes, but I was too slow... or caught up in the moment of watching this woman take my brave child to her first day of school -- and I had missed her cheek. Standing by the car, while the woman shut the door, CC looked at me and smiled. "I love..." I choked, "you." And I watched as she walked to her place, hand-in-hand with this other person. And she didn't flinch. She was ready. When I picked her up at the end of the day, I could see how happy and excited she was. "It was great, Mommy!" she squealed when they placed her back in the car. Just like she said it would be. That image made your mouth water ... just a little, right? Summer might be setting soon, but on these hot SoCal days, ice cream is the perfect antidote to steamy afternoons or evenings. 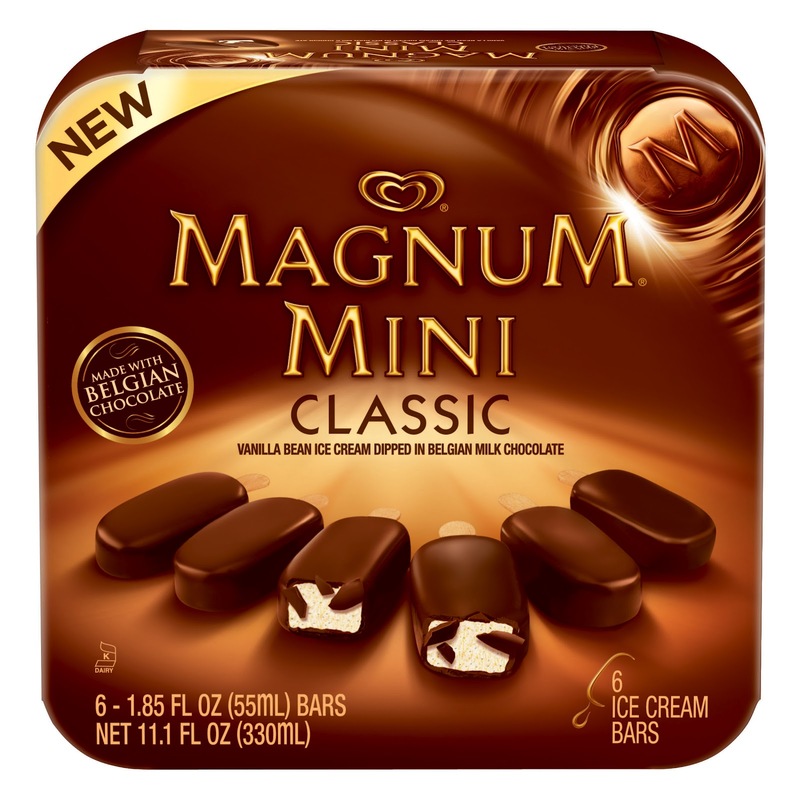 So when Unilever, the name behind such famous brands as Magnum, Popsicle, Klondike, Breyers and Good Humor, invited me to check out some of their new offerings gratis, how could I refuse? After all, combine scorcher days with a pregnancy appetite, and, well, let's just say our freezer is happily stocked. While I was happy to try out some new offerings, I was surprised by how pleased we were with the classics. CC is my little Popsicle girl (and because we don't usually stock a lot of frozen treats, she was happy to have one as a treat on the weekends), while I gravitated toward the Klondike bars and Ian, the awesome Magnum Minis. And speaking of the minis (pictured above), they're pretty genius! Popsicle, that childhood staple that I remember loving, has branched out and created a few new versions (Yosicle, with a yogurt center, and a Sour Patch Kids incarnation). Honestly, the classic flavors of orange, cherry and grape sounded the best to CC and me, so we stuck with those. 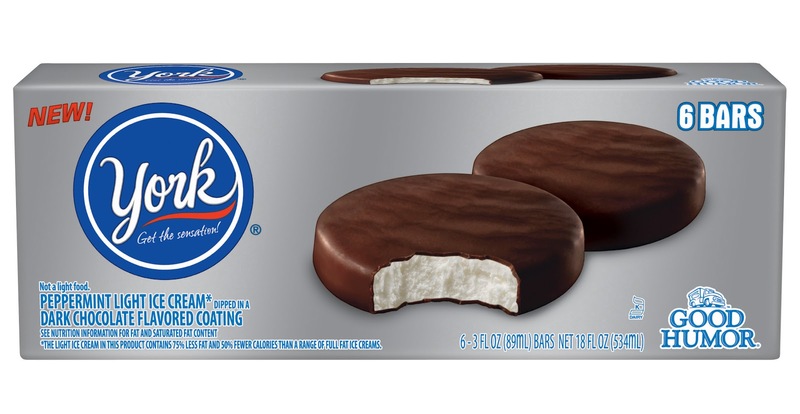 Same goes for Klondike. I loved their mint chocolate chip square bars and decided to go with those over their new Choco Tacos. As far as new offerings, though, I'd love to try the new York Peppermint Pattie ice cream bars from Good Humor. OK, so are you wondering now if my sweet tooth has gotten the better of me? I think I need to go have some broccoli now. Either way, however you decide to treat yourself during this hot summer, enjoy (in moderation, of course), and stay cool! Ian and CC are ready for Legoland action. Summer may be coming to a close (CC starts kindergarten on Thursday! ), but we were still able to squeeze in an action-packed day at Legoland California Resort last Saturday -- and see lots of new attractions along the way. You might remember our last two visits to the little-kid-friendly theme park here and here, but this year it was all about the water park and the (relatively) new Star Wars Miniland. Ian and CC splish-splash in the Duplo Splash Zoo. It was a sweltering SoCal day, so the water was a welcome refresher from the August heat. Apparently, what seemed like a million other people had the same idea, because the water park itself was literally filled to capacity shortly after we arrived. CC explores Star Wars Miniland. Next up was Star Wars Miniland, which is part of the greater Miniland USA, made up of Lego sculptures of famous landmarks. Ian and CC were totally nerding out in this area. I just stood back and watched ... and took pictures. CC got up close and personal with a Lego Princess Leia, Chewbacca and R2D2, while also eyeing the above AT-ATs (I had to ask Ian what those things were called). She also checked out the Capitol building, the White House and our very own Griffith Observatory. CC in front of the Lego Capitol building. It's amazing to see all of the mini structures that are made from Legos in this area. How long did it take to make each one, I wonder? Before we called it a day, CC got to have her pic taken with a very new Lego addition, the girl-friendly Lego Friends. These girls sang mini concerts around the park and took lots of photos with the kids. Very smart, Legoland. With that addition, you instantly hooked my song-and-dance-loving daughter! UPDATE: Congrats to Carol W., who won The Wiggles DVD! It's birthday time for Aussie kids' group The Wiggles, and CC got a front-row seat -- to the DVD extravaganza, that is. In their new DVD, The Wiggles: Big Birthday!, from NCircle Entertainment (SRP: $12.99), the singing, dancing and super-smiley guys from Down Under are celebrating with footage from their live shows. And speaking of live shows, the group is on tour right now in select U.S. cities, actually saying goodbye after more than 20 years, and handing the Wiggles baton to a new generation of performers. But before they do that, Murray, Sam, Jeff and Anthony (the one in the blue shirt who's CC's fave, she said) are celebrating with kid-friendly fun, alongside friends Captain Feathersword, Wags the Dog, Henry the Octopus (another CC fave) and Dorothy the Dinosaur. CC enjoyed lots of laughs while watching Big Birthday! Not only were the live performances a big hit, with the guys' spontaneous laughter and cheers from the audience, but she also loved their animated friends as well. In addition to the main attraction, the DVD also offers a special bonus feature, the one-hour documentary Everybody Clap! Everybody Sing! which highlights The Wiggles' first 20 years. 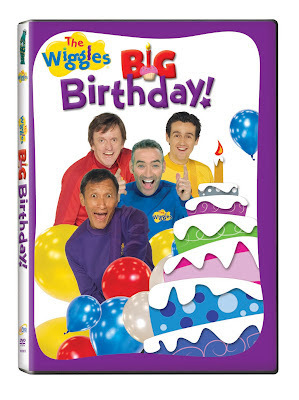 I'm giving away 3 copies of The Wiggles: Big Birthday! DVD! To enter, visit and "like" the NCircle Entertainment Facebook page, and leave a comment below telling me why your child would like The Wiggles DVD. For more chances to win, follow me on Twitter and retweet this giveaway. 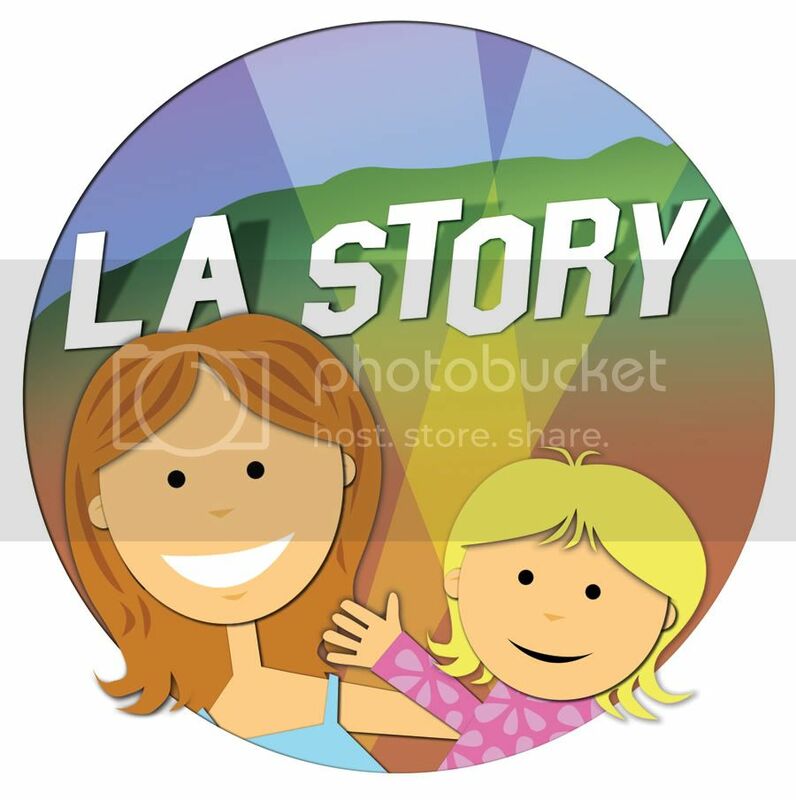 I'm at @la_story. It's getting to be about that time when I start feeling like a house. I'm 31+ weeks now (Friday will be No. 32), and everything seems to be stretched to its maximum. Skin, shoes, dresses. (I gave up pants about 14 weeks ago.) Someone, somewhere is laughing at that, I know, especially since I still have about eight weeks to go. I know, I know. I haven't maxed out just yet. Despite all of that, I honestly can't wait to meet this little guy. He's rolling around, kicking (informing me via stomach aches that he prefers savory over sweet foods) and reminding me every day what amazing things pregnancy and childbirth are. If you're anywhere near The Grove on Wednesday, you might want to check out ticket marketplace StubHub's 20-foot talking(!) tree, the Ticket Oak, which will be handing out lots of prizes, including gift certificates and tickets to local L.A. events. When: Weds., Aug. 15; 12 p.m.-7 p.m.
First of all, I love giving a shout out to local schools and their family-friendly activities. And this Tarzana event looks like a great time for kiddos and parents. Not only that, but it's also a showcase for Woodcrest Preschool, which is offering $300 off tuition for any new family that enrolls. 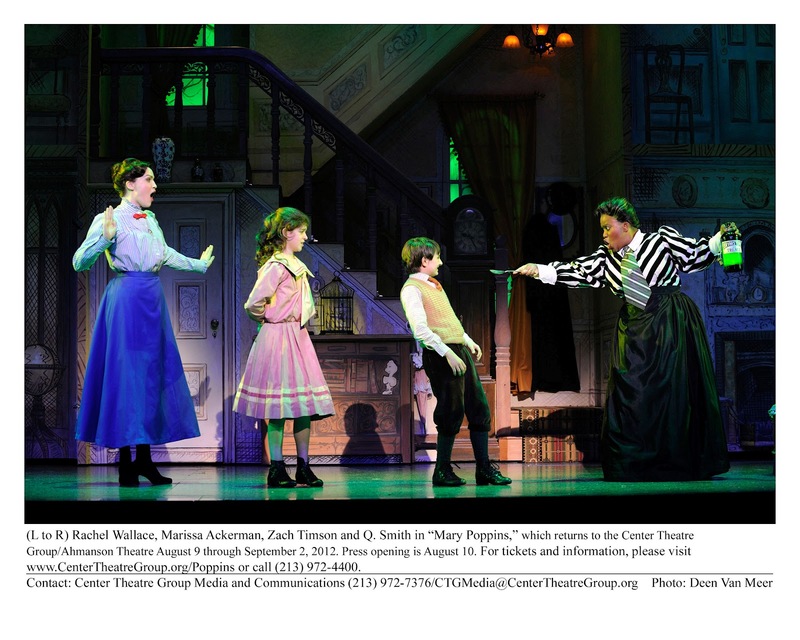 When: Sat., Aug. 18; 11 a.m.-1 p.m.
'Mary Poppins' at the Ahmanson Is Supercalifragilisticexpialidocious! Racing down to the Ahmanson on Friday to catch the opening night of Mary Poppins was its own thrill ride, as I wondered what CC might think of this magical musical. She hadn't seen the movie, which was fine, but I'd heard that the live theatrical version was a bit darker than the Julie Andrews version we all know and love. What would she think? Was I going to traumatize my child after subjecting her to the undead the week before? Was I actually taking her to see "Scary Poppins?" Turns out, all of my worries were for naught (whew! ), and she had a fantastic time, even jumping up to give a standing O before I could get out of my seat. And scared? Not even brimstone and treacle could jar this kid. While the basic story of a mysterious and clever nanny appearing out of seemingly nowhere to take care of two over-privileged but sometimes under-appreciated children is pretty much the same -- complete with your favorite tunes! -- the Disney/Cameron Mackintosh musical version is more mature and certainly more complicated. But that's not to say it's not fun! Jane and Michael Banks (Cherish Myers and Zachary Mackiewicz), the children who have scared off their fair share of nannies from London's 17 Cherry Tree Lane, certainly seem naughtier. But once Mary Poppins (Rachel Wallace) arrives, she holds her own with appropriately theatrical flair -- even to a grumpier-than-I-remember dad (Michael Dean Morgan). It's this flair, though, that makes Mary Poppins a rousing crowd-pleaser from the get-go. Mary is sassy, independent, imaginative and loving -- and she knows how to show kids (and Bert, the chimney sweep, played by Nicolas Dromard) an incredible time. But this nanny is no pushover. She can open the eyes of downtrodden and jaded adults as well. The music, dancing and sets are all fabulous -- I loved how the Banks house opens as if it's a dollhouse, a place of make-believe -- and there are other spectacular set pieces throughout the musical. I don't want to give anything away -- including a fantastic potential rival to Mary (Q. Smith) -- but be prepared to be amazed, especially by the show's last bit of magic. Norman and a couple of undead friends on the ParaNorman "green" carpet. 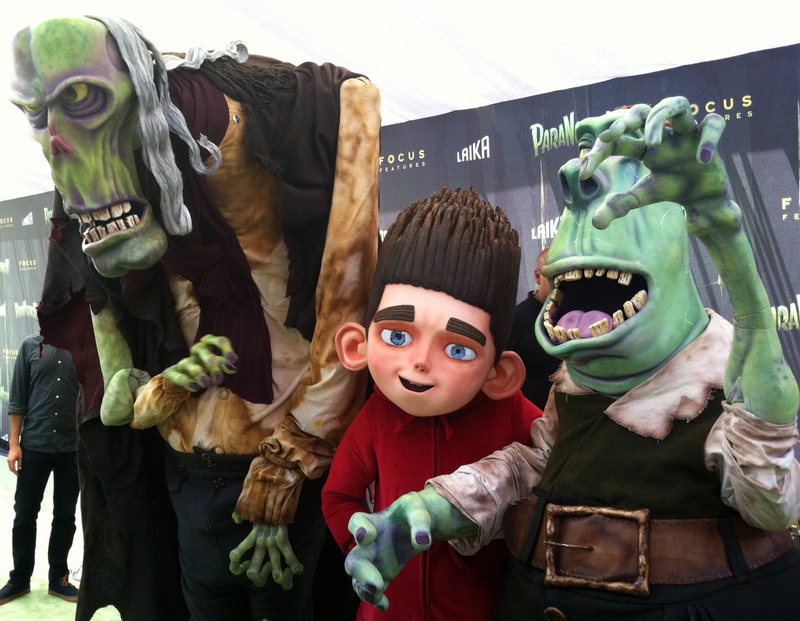 There were zombies, teen starlets and ogling fans rocking the "green" carpet last Sunday at the premiere of stop-motion animated film ParaNorman at Universal Citywalk. Face-painted kids (some with famous parents like Wayne Brady, Dave Foley and Leslie Mann) were out in force, ready to check out the new kids' pic from LAIKA (makers of Coraline) and Focus Features, which officially opens on Aug. 17. Keep in mind that the film is geared toward tweens and teens, and little ones might get a bit freaked out. 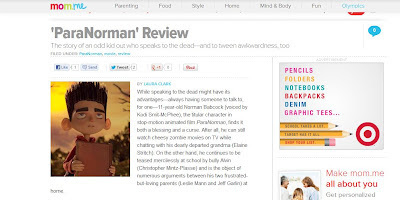 Check out my ParaNorman review at mom.me. Back on the carpet, I had fun talking to director Sam Fell, writer Chris Butler, actor Jeff Garlin (who voices Norman's dad) and Kodi Smit-McPhee (who voices Norman). In fact, here are a couple of my video interviews, with Fell and Smit-McPhee. Enjoy! The world's best nanny will be dropping down on her magic umbrella this week in downtown Los Angeles, as Mary Poppins opens at the Ahmanson Theatre on Friday, Aug. 10 (with one preview performance Aug. 9). A co-production of Disney and Cameron Mackintosh, with Julian Fellowes (of Downton Abbey fame) writing the book, Mary Poppins the musical will feature both classic songs (Yay A Spoonful of Sugar, and I won't even try to spell the even more famous one! ), as well as new ones. 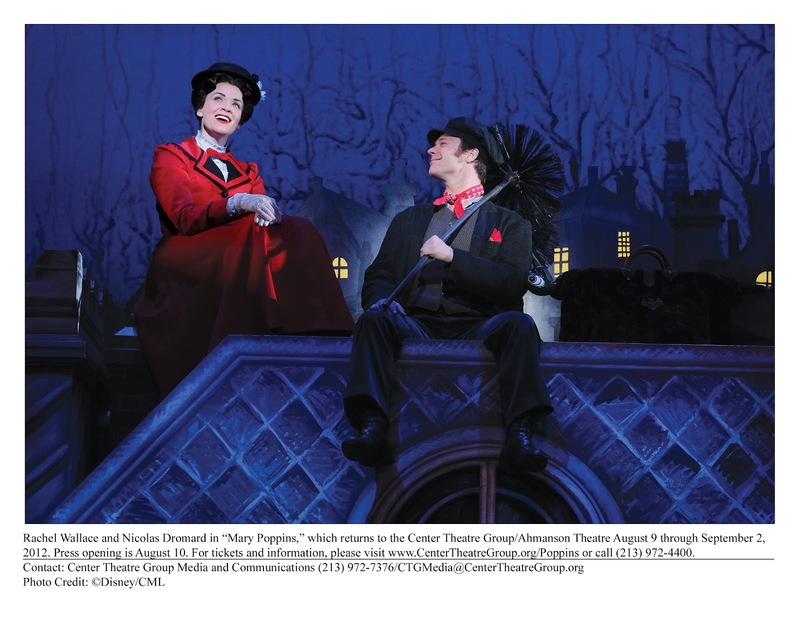 Mary Poppins, which has appeared on the West End and Broadway, will be running at the Ahmanson through Sept. 2. Tickets start at $25. 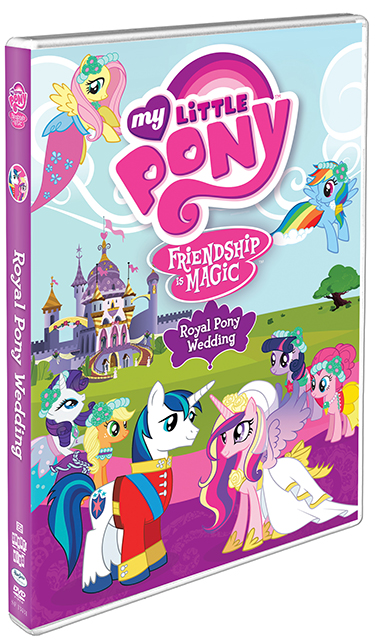 If you remember anything about how much fun CC had at the My Little Pony "Bridle Shower" at Royal/T earlier this year, then you'll have a good idea of just how excited she was when she found out I had received the My Little Pony -- Friendship Is Magic: Royal Pony Wedding DVD to review. Saying I was the best mom ever would be an understatement. The DVD (SRP: $14.97), from Shout! Factory and Hasbro Studios, hit store shelves today, and it's definitely a must-have for all of those pony fans out there. The disc features not only the two-part royal wedding drama (yes, there's serious pony drama here! ), but also three additional episodes, sing-alongs and coloring sheets. The royal wedding episodes aired on The Hub TV network, but here's a brief rundown. When Twilight Sparkle finds out her older brother, Shining Armor, is getting married -- via invitation as opposed to hearing it straight from the, ahem, horse's mouth -- she gets more than a little upset. When she finds out that he's marrying Cadence, Princess Celestia's niece, a beloved figure from her past, things seem to take a turn for the easier. But there's something mysterious and strange in the works, and Twilight Sparkle has to figure it out before things get really crazy. CC adores the two-part Canterlot Wedding, and she also loved that there were bonus episodes, such as Hearts and Hooves Day, in which a love potion is actually a love poison. So two thumbs up for this DVD. I already know it's going to get a lot of use. It's all about books this summer, and I'm not complaining! JetBlue and PBS Kids are teaming up for Soar With Reading, a cool summer reading program that kicks off Tuesday, Aug. 7 (1:30 p.m.) with a free event at the downtown Los Angeles Public Library. And you're invited! The program, in its second year, helps place books into the hands of kids in need (in LA, that means the Los Angeles Universal Preschool), and everyone can help. If you happen to be downtown tomorrow (or can make it there), you'll be able to check out a performance by PBS Kids' Mr. Steve, take in a reading by Barefoot Books author Susan Reed and receive fun learning materials to help get ready for the new school year. 1. Visit SoarwithReading.com and share the name of your favorite kid’s book, and for every submission, JetBlue will donate an age-appropriate book to a deserving child through partner Barefoot Books, with a generous local donation being made to the Los Angeles Universal Preschool. Up to $200,000 worth of books will be donated nationally through this program. With sumptuous artwork that looks good enough to reach out and touch -- and sometimes cuddle with -- Dr. Seuss' The Lorax on DVD ($24.99), which arrives Aug. 7 from Universal Studios Home Entertainment, is true eye candy. Based on the Dr. Seuss book (apparently the author's favorite work), The Lorax film tells the story of Ted (voiced by Zac Efron), a 12-year-old boy who lives in Thneedville, which is completely devoid of real trees. (What the town does have are plastic replicas that can light up with a simple click of the remote.) To impress an older girl (Taylor Swift), Ted goes in search of The Once-ler (Ed Helms), a hermit who might know how to find a real Truffula tree. While talking to this mysterious creature, Ted learns about the Lorax (Danny DeVito), a furry little grump who speaks for the trees. The story, of course, is about the environment and the sometimes selfish way we treat it. It's the children's tale of Joni Mitchell's famous Big Yellow Taxi, in which they (we?) paved paradise and put up a parking lot. And make no mistake, paradise really looks dreamy in this illustration, led by Illumination Entertainment (Despicable Me). The Truffula trees, with their bright puffs of cotton-candy fur, look inviting and harmless -- so much so that it really does make you ache when you see the first one cut down. The Lorax himself, whose fluff of a mustache belies his grumpy but loving nature, is there to remind The Once-ler that the trees are not to be cut down ... ultimately to little avail. I won't spoil the rest for you, but the film is both funny and wistful -- a great reminder of how we should better appreciate the world around us. If I were going to quibble, there was a key plot point that me wonder why the trees hadn't been replaced long ago. But it's tough to be persnickety when CC loved the movie (and has watched it three times since we received the review copy last week; of course, being sick had something to do with that). She even understood the idea that destroying the beauty around us can be very sad. 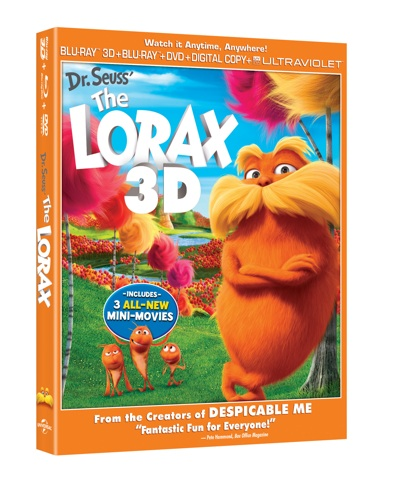 The Blu-ray-DVD-digital combo pack also has a ton of features, including three mini-movies, the making-of the mini-movies, a "Seuss to Screen" look at how the book became a movie, games and a sing-along. CC and friends have fun at her summer book party. CC is right on the brink of really reading, so this summer was perfect timing to host a book party with all of her fellow pre-K and soon-to-be K friends. Thanks to PBS Kids and iVillage, we did just that. Both PBS Kids and iVillage wanted to show their support for literacy, so they sponsored a reading party complete with books for all the kids, activity sheets, temporary tattoos, stickers and fun notebooks for drawing. While the kids kicked off the party by coloring their favorite characters or decorating arms and hands with temporary tattoos of Super Why and his friends, we finally gathered kids and parents together to read a Scholastic book There Was an Old Lady Who Swallowed a Chick. Talk about a great time! The kids loved being read to way more than I would have imagined. The story, about an old lady who swallows everything from a chick to an Easter basket, had the kids in stitches. They even shouted out things like "Why is she doing that?!" and "It didn't make her sick!" the latter a line that's echoed in the story. I loved watching them laugh and giggle at the story. Reading is so important, and it's always great when you can start early and make it fun. If you're interested in making a game out of reading this summer, have your kids join Scholastic's Summer Challenge (through Aug. 31). They can log their reading minutes and earn fun rewards, while helping to set a world record for summer reading. It seems as if summer's flying by. (It's already August!) But what a great way to get ready for school!